After a great summer holiday in Cornwall where I’d done some nice long runs along the coast and swam most days I thought “hmm, maybe I’ll join the kids and give this triathlon thing a try”. I’d assumed that triathlons were usually run around towns or in an athletics environment – most junior events are run on cycling tracks and running tracks. I learned about the more adventurous side when somebody told me about the Helvellyn tri. Oh right, so you swim in a lake, bike through the mountains in the Lake District, then run up a mountain? That could be fun I thought. If you’re thinking of joining a tri club, just do it. Don’t wait until you feel fit enough to qualify, don’t assume you’ll be laughed at by men with shaved heads and sunglasses wearing Mad Beastard Tough Mucker event t-shirts, just get out there. Turning up at Kendal Tri Club for the first time wasn’t that intimidating at all and I fitted right in to the regular swim sessions with the friendly coaches and members. I wasn’t that quick at swimming, but persevered and reached the dizzy heights of “lane 4” which tends to combine quite fit men expending a lot of effort with women swimming more efficiently at a similar speed. Run training was just an extension of the local trail and fell runs I’d been doing on and off for years. Biking involved me swapping mountain biking for road biking, which I’m still not quite sure about …. My first race was a half iron distance event in 2016, Tri Hard’s “A Day in the Lakes”. This went well, I surprised myself a little with a decent result (for a forty-something busy Dad anyway…). I realised that maybe this iron distance thing was doable after all. 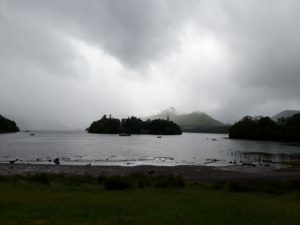 Some other Kendal Tri club members did the Lakesman that year and had really good races – it was the obvious choice for anybody in Lakes looking for their first full distance race. I’d casually considered the Lakesman when looking for races to do in 2018, but it had sold out. “Ah well, maybe next year,” I thought. I put my name on the waiting list anyway. The main problem was with this was that I got an email in December offering me a place. A quick chat with my wife and I was in. I must have been keen because I offered to do all the ironing for the year in return to make up for the time I’d spend training. Training started in December. I followed a plan on TrainerRoad – a program you use on your laptop or phone / tablet to do turbo trainer workouts, which provides full triathlon training plans. The bad weather we had over winter and early spring made it easy to do the indoor bike workouts and swimming and running aren’t a problem in winter. I knew that disappearing for hours during the daytime at weekends wouldn’t be an option and tried to slot in workouts without blowing a massive hole in the middle of prime family time: A run while the kids were at swim training, cycle or swim during lunch hour, 5AM turbo training sessions. I think the longest turbo trainer ride I did was a 4 hour session in March, nice and cosy in the garage during some spectacularly cold and windy weather. Early morning workouts are “free”. Get up at 5:00 on a Saturday, train for 4 hours and you’ll feel great. You can join your family at 9 and give them your full time for the rest of the day. This early morning time is yours, it is still dark, the world is peaceful and most people are asleep – you have time to live in the moment. You are soaking in your own sweat in the corner of a garage looking at the German language side of a hedge-trimmer box. The one rule about early morning workouts is that nobody admits they’re tired later in the day. Depending on how well you sleep in general, you’ll probably need an early night before or after to make up for the early start. It won’t be that kind of early night either – you might be missing time you normally spend with your partner, so don’t overdo it. Plan workouts and talk to your family about the best time to do them. Don’t sit there waiting for the perfect moment. You’ll get stressed because you haven’t fitted it in or annoy people with a last-minute announcement. None of the above works. Training for long races takes time, you are probably spending more time training than most “normal” people. Keep an eye on things, be thoughtful. The plan included a long run every other week and I cautiously eased up the distance. I also ran a few of the local Kendal Winter League fell races and could feel my running speed improving. The suffering of an all-out 40 minute fell race seemed to pull up the long-run pace that I could sustain comfortably. In terms of “nailing” workouts, January to March were probably my best training months. There was a minor blip due to a week away followed by some awful faffing with replacement bike parts. Then the weather improved, which shouldn’t have been a problem, but it was. It sounds really strange, but I’d got into the habit of the turbo training sessions – the computer told me exactly what to do and I did it and the numbers showed me getting stronger on the bike. This worked fine in the cold weather but I couldn’t face that corner in the garage once the weather improved. And it improved enormously with long beautiful sunny days. This threw me initially and I needed to rework my familiar training habits. It was simple in the end. Replace the hard interval sessions on the turbo with outdoor hill reps (why does the Greyhound have to be my local hill? It’s literally 2 minutes away…). The medium intensity and long rides could be done on the road (no more long rides on the turbo trainer!). I started thinking more about the practicalities of the race, reading lots of race reports, blog posts and forum discussions. Would I really end up peeing on the bike to save myself a few minutes? Would the “wheels come off” halfway through the marathon, slowing me down to crawling pace? I’d read loads of race reports about sub 3:30 marathon runners being reduced to a walk in an ironman. I soon realised that this was the make-or-break moment of a triathlon at this distance. Everything is about running well. I love that light-and-easy feeling you get when you’re running on fresh legs. I wondered how I’d be running out of T2. I had done a flat 20 mile training run at 7:26 min / mile pace and reckoned I could have maintained this for another 6 miles, which would give a 3:15 marathon time. I knew that my pace would be a lot slower after the swim and bike but it was encouraging. I did a few brick runs after long rides and found myself being able to set a decent pace but I had no idea how it would go on race day. Race day approached rapidly. I hadn’t followed the training plan to the letter, averaging 10 hours per week during these last 10 weeks. I’d missed some longer rides in April, but managed to fit enough in over the last 6 weeks to feel prepared, including a full 112 miler. Some days I just stopped stressing about fitting in workouts and had a rest. I deliberately reduced the distance of the last 2 long runs, preferring shorter, more frequent runs to avoid injury. I was confident that I had enough endurance to do a half-decent run and didn’t want to push it. Looking back, my run mileage was actually ridiculously low. Maybe I wasn’t “respecting the distance” or something and would suffer on race day. On the plus side, I was training regularly and consistently, I didn’t get ill or injured and I was feeling as ready as I would ever be. I started to think about my goal race time. I thought I’d be swimming “1 hour something”, riding around 6 hours (let’s say “5 hours something”) and running “3 hours something”. It would just be a case of 9 hours plus whatever all those “somethings” added up to. It looked like I’d be aiming for the 10h 30m – 11h range. The 5:30 bike split I’d entertained earlier in the year seemed out of reach based on the pace I was averaging on long rides. I knew that the bike course was “flat” (ish, a big “ish”), but I wasn’t able to fit in a day out to recce the course and really had no idea of how it would go on the day. More to anticipate, the excitement was building! Try this: Next time you feel nervous and have that strange empty feeling in your belly, take a deep breath and try to convert that worry and anticipation into something positive. Think thoughts like “bring it on” if you have to. Does it help? That nervous feeling is double-sided – it feels bad sometimes, but it will also be what drives you on in new and exciting situations. I was nervous about the prospect of messing up the race with a wrong turn during the swim, a mechanical problem or bike crash, pulling a muscle during the run. But still … bring it on. I was feeling pretty positive as race day approached – it would be ridiculous to put all that time into training and then dread the race itself. This is it, it’s really happening, I can’t believe it, here we go, have I got everything? I hope so, the hooter is literally going to go in 10 minutes. The hooter, OMG the hooter, yep that actually makes me feel quite nervous. I’d recently watched a video of last year’s race and I couldn’t forget the sound of the starting klaxon. Now I know why. Of course! It’s the hooter that sounds at that moment when you start moving. One minute you are waiting, the next you are moving. You will be in the race, the race! We’re walking down the carpet towards the lake. The line of orange buoys extends an intimidatingly long way out. I try to break down the distance. The first milestone is the yellow buoy where the half distance swim turns right to go around the island, the second will be the right turn where the full course turns right. “The full course”? I’m doing an iron distance race, I’m about to swim 2.4 miles, in a race, what am I doing? It’s early in the morning (6:00AM) but it’s not too early. It’s time, no excuses. Phil and Marie, the event organisers high-five each competitor as they make their way down to the lake. I get to the edge of the water and don’t break my step, straight in, walk for a bit until the water gets to waist height (the water level is very low), then launch myself into a warm up. I need to get moving – I don’t want that “first few lengths ugh out of breath” feeling 2 minutes into the race. I get as much of a warm-up in as I can, then get ready for the hooter. The hooter – that’s enough rambling about hooters I think, but seriously, the hooter. I manage to find somewhere to stand up – this happens to be right at the front, not where i’d planned on starting, but the start line is very wide and it’s quite spread out so there aren’t many people behind me. Nobody seems ready, but we quickly get into position as an oddly delayed “10 9 8 7” dances across the water from one of the piers where the officials and spectators start the countdown. And that’s it, the hooter sounds and we’re off! No sprint start, just nice steady long strokes, breathing every 3, sighting every third breath. We pass a few buoys and it’s going well. I’m warmed up and feeling good. Before I know it the yellow buoy is my next target. Conditions are good. The water is flat, there’s no glare to deal with and every time I look up I seem to be on target. We reach an orange buoy and everybody turns right. Wow, that means we’re already at the last buoy in that long line that had seemed so distant earlier on. I’ve been swimming my own race so far, vaguely conscious of where other people are around me. I look over to my left and see a fellow swimmer moving quickly next to me. His stroke rate is way higher than mine and his legs look low in the water but he’s just as quick. The name “Sinky Bum” comes into my head for some reason. “Yep, there he is, I’m still with Sinky Bum,” I think a few minutes later. I’m not taking the piss. Maybe I look like that when I swim, maybe I caught him when he raised his head to sight, but the name sticks in my head. I realise that the people I’m swimming with now are probably going to finish the swim at the same pace I’m swimming at. I think it might be a good idea to try and catch a draft now, swimming close behind somebody to save some energy. This is exciting, I’m thinking tactically rather than just hanging on for dear life. I manoeuvre myself behind Sinky Bum and try to follow his feet. The feet disappear, I don’t get it. It looks like he’s shifted to one side. I’m a “polite” distance back, rather than playfully tickling his toes and I don’t think he’s deliberately trying to stop me getting a lift, but he’s impossible to follow. I look up and try again. Then with somebody else. It proves more trouble than it’s worth. With the water level being a lot lower, mud is being churned up from the lake bottom and visibility isn’t very good. I think that’s what’s making it difficult, the feet I’m trying to follow get lost in the murky water as soon as they’re more than 50cm away. I decide that the water I’m in is probably surging in vaguely the same direction that I want to go in and give up on the drafting idea. This keeps me busy for the long return stretch before we turn right. At this point, our next target is the finishing arch on the lake shore. I’m feeling good, my work rate is steady rather than all-out and I start contemplating the next leg. I pull my bike off the rack, jog for the mount line, hop on and go. It’s a totally new environment now, the breeze feels cool on my wet tri suit and there’s a rushing sound in my bike helmet as I pick up speed. It’s still early and Keswick is quiet as we make our way through the familiar streets. Shops and cafes that I’ve visited on relaxing days out fly by. We exit the town onto the A66. I have that 5:30 bike split in mind and will be eyeing the average speed field on my bike computer. I basically need to average 32 kph (20 mph) for the ride to hit that time. The ride begins with a comfortable flat stretch. I’m not chasing anybody or worrying about people overtaking me and keep things steady for the first 30 minutes. It’s a smooth classic A-road TT ride at first and riders are travelling at speed with very little effort, perfect. I’ve been breaking down the course – flat at the start, some hills, a long flat stretch up the west coast that looks like it’ll have a tailwind. The first hilly stretch slows us down but there’s still a long way to go and I’m banking on bumping that average speed back up on the flat middle stretch. The aid stations are run by volunteers who hand out bottles of water and energy drink for you to grab on the fly – it’s amazing. I don’t need to top up when I hit the first aid station but have a good look as I pass. They’re normally based in a layby on the road. A line of volunteers holds out bottles of water, energy drink and food. I’m ready for a refill when we get to the second one. “Who’s got water?” I shout out as I approach. “He’s got water, over there,” somebody helpfully replies. The fourth person in line holds out a bottle and I pluck it from his hand as I pass, squirt it into the aerodynamic bottle between my aero bars (essential equipment if you’re aiming for a 5:30 time) and sling it onto the grass verge with a load of other empties at the end of the aid station. Smooth. I feel like a pro in the Tour de France. The encouragement from the helpers gives a real buzz – they’re great. Nothing that exciting happens on a long bike course like this. You can’t ride alongside people to chat due to drafting rules, you’re basically riding a very long time trial. I reflect on how many of the people doing iron distance events would prefer sportive-style rules that allowed riding in groups – there’s plenty of time to think random thoughts as I chug along. The race seems to have settled now. I trade positions as we descend towards Egremont, picking off a few people, before getting overtaken by people who had come out of the water later and are making up time. There’s no point chasing people. Either they’re faster and I’ll wear myself out trying to keep up, or they’re going too fast and will be slowing up later. Hey, where’s the flat section and tailwind that I’ve been counting on going to start? There’s a final long climb after Whitehaven and then, sure enough, we’re cruising along slightly downhill at around 40 kph. I see my average speed begin to creep up and start to feel good about the bike leg. 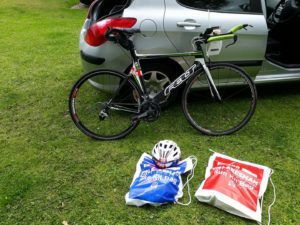 Long course bike racing goes on a bit though and I start feeling a bit of discomfort – achy shoulders and a bit saddle-sore – tri suits are never that comfortable for a long bike ride. I’m matching the speed of a rider in front of me, staying back to avoid drafting. He sits up to take a break at the top of a small climb. I don’t feel like overtaking him so have a quick stretch and big gulp of energy drink – this really helps and I start to feel comfortable again. It feels good that everything has gone to plan so far. My average speed creeps up to 34 kph, enough in the bank to make up for the climbs in the last third perhaps?. Quite a few people have come out to watch and encourage us and I shout “thanks” back to most of them, trying to be as friendly as possible to offset the Judge Dredd look of my visored bike helmet. The ride along the west coast continues with a beautiful stretch along the coast all the way up to near Silloth. At this point there’s a short loop where we head back down, then out to the coast again to repeat the last section of the West coast stretch. “Oh,” I think as I round a corner and feel a strong head-wind. The wind has picked up more than expected. I decide to stop for a toilet break at the next aid station, deciding that life is too short to piss in my tri-suit and shoes. There are only 2 portaloos and they’re both busy. They remain busy for 2 minutes. I’m wasting time, frustrating. I jump back on and head back out, wasting another 2 minutes further down the road by a hedge. Soon, the second loop is complete and I’m heading back to base. From my earlier route breakdown I know that that’s two thirds down and 40 miles to go. The continuing headwinds and climbs are tiring though – it feels like the wind is somehow changing direction in order to be as annoying as possible. I remember that the big gorilla sitting on it is the least aerodynamic thing about my bike setup and focus on staying as low as possible. I break the last bit down: First we take Cockermouth, then we take Keswick. There are plenty of climbs left and I see my average speed dip to 31 kph. The final stretch back to Keswick, that beautiful stretch of road alongside Bassenthwaite Lake, feels like it should be really fast, but it drags on and I can feel a strong headwind. My average speed creeps up again – I won’t quite make 5:30 but I’m not far off. I keep a steady pace and start to contemplate the fact that I have a marathon to run. I feel like I’ve paced the bike well but have no idea how I’m going to feel. The blast back though Keswick is exciting. We we wind through streets lined with spectators who are watching the bikers come in and clapping on the runners on the shorter “Lakesman Half” race. A 5:40 bike, not bad – I can blame 10 minutes on the wind and aborted toilet breaks. Thankfully there would be no more mishaps during this race. I’d got through the swim without going off course, survived the bike without a breakdown or crash, just the simplest of disciplines to go: a run around town. The assistance from the volunteers in transition is amazing. As I rack my bike, a volunteer shouts my number through to the changing tent. Somebody is ready with my bag and passes me my running gear as I sit down, then puts away my bike shoes and helmet. It’s a quick change, into my running shoes, start my watch and go. The moment of truth was approaching, would I enjoy that light and easy running feeling, at least for some of this race? Probably not. There are 5 laps of 5-and-a-bit miles (8350 metres apparently) and you pick up a wristband at the start of each lap. At the end of the 5th lap you run down the finish chute and through the finishing arch. I have a stitch as I begin the first lap through the park – I rarely get stitches and put it down to the contorted position I’ve been holding on my bike. I know it will pass in time. I’d sworn to myself that I’d run at an easy pace for the first 2K. My quads feel a little dull after 112 miles on the bike – it has a strange anaesthetic effect and I’m finding it hard to judge my pace. My Garmin watch is being silly so I haven’t got that to guide me either – 5 mins on and it hasn’t started GPS. I restart it as I run, being extremely careful, this is not the time to catch a toe and launch myself into the road. I concentrate on following the course for the rest of the first lap. It’s a bit of a contrived loop in and around Keswick with repeating sections on the same road for a couple of miles. It proves easy to follow with the marshalls pointing the way at each turn, but I concentrate carefully the first time around. I’m not paying enough attention to my pace. I’d set out too quick, running the first lap at 4:29 min/km pace. Idiot. There’s a long way left to go and as I exit the park on the second lap and begin the slight uphill to Booths, I feel a tap on my shoulder. It’s The Man – I owe him for that last lap and he wants paying. I settle into a more sustainable pace, frustrated that I hadn’t taken things easier on the first lap. I’m feeling tired but steady as I begin the third lap. I cross paths with fellow Kendal Tri Club member Darren and have a brief exchange. “How you doing?” I ask. “Could be better,” he replies. “Yeah, knackered,” I mutter. Cheerful moment that! 3 laps down and I back off from the idea of an all-out effort on the last 2 laps. The thought of digging deep has no appeal right now. 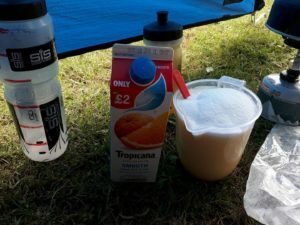 I don’t have much appetite but force down energy gels and water from the aid stations. It becomes a real effort to hold a pace that feels so effortless with fresh legs. I begin to wonder whether I should have done a few more long runs, but at the same time I don’t beat myself up about it. I think back to the first time I’d heard about iron distance races and the respect I’d had for people who did them – here I am running pretty strong and heading for the finish. This is amazing, I’m going to finish an iron distance race! Lap 4 means that I can start drinking coke at the aid stations (my rule, you can have some earlier if you want). There are only 2 laps to go. While waiting for the much-needed sugar and caffeine-rush, I try to break down the rest of the race into sections. There’s still a lot left to do. I see some people who are just starting out on the run. The encouragement from the marshalls and spectators keeps everybody going and it feels like nobody is going to give up at this point. People do iron distance races in a wide range of times. Some are held back by injuries or illness, others are just starting out. That person coming in close to the cut-off time might not even have been able to run for 10 minutes at a time last year. Their achievement in even getting onto the run course is up there with that of a top 10 finisher. In fact, the people taking a little longer are probably having to draw on their mental reserves even more than fitter or more experienced competitors. Respect! Obviously, there’s a lot of crap going on in the world and flogging yourself around a swim, bike and run course is the least of some peoples’ worries, but you can’t help but admire the effort that you witness at a race like this. I jog through the Kenyan Corner aid station for the last time, holding up my right wrist with its 5 wrist bands jiggling merrily in a Andy Murray style victory pose. The wrist bands are mine and nobody else is having them. I’m in the 5 Wristband Club now and this has special privileges, including being allowed to turn left towards the finish chute, rather than heading out for more laps. There’s a final stretch lined with people cheering and I’m grinning like an idiot showing them my wrist bands. Spectators are allowed to join family and friends as they finish the race. We hadn’t planned anything, but the grinning faces of my 2 daughters appear on either side of me as I get to the carpeted finish chute. I stop to make sure they’re both with me and we run the final 30 metres together to the finish line (I should point out that they were both easily capable of dropping me at this point if it came down to a race). And that’s it! The race is done, I’m a Lakesman! I have swum 2.4 miles, cycled 112 miles and run a marathon. Run time 3:30, total race time 10:25. “Ugh, that was tough, ” I say, “not really sure this is my thing, that run felt hard.”. It’s soooo nice to be able to stop running. I stay on my feet and walk around for a while rather than collapsing onto the ground, easing the transition from effort to rest so that my legs don’t seize up. My wife is looking at the results online – ”Er, I think you were 16th overall, 5th in your age group. ‘Not really my thing…’, you sure?” I’d had no idea where I was positioned in the race. I’d exited T1 (transition 1 after the swim) in 32nd place. Finished the bike in 34th (that stupid wait for the toilet! ), gained 2 places in T2 (the transition from bike to run), then made up 16 places on my badly paced run. More grinning ensues. So that’s it. I can’t believe I’m sitting here a week later. It’s all over but the great memories are there and I’m secretly enjoying sleeping in and having a break from training. Then again, I keep seeing posts from people who are signing up for next year and it’s proving hard to resist. That could be me doing the ironing for another year. Escape from the snow – Joe Beer Triathlon Training Camp.